This page will walk through Spring Data CrudRepository example. It provides generic CRUD operation on a repository for a specific type. CrudRepository is a Spring data interface and to use it we need to create our interface by extending CrudRepository for a specific type. Spring provides CrudRepository implementation class automatically at runtime. It contains methods such as save, findById, delete, count etc. If we want to add extra methods, we need to declare it in our interface. All the methods of CrudRepository are annotated with @Transactional in implementation class by default at runtime. In our example we will create a REST application to create, read, update and delete articles using JavaConfig as well as XML configuration. We will also write client code using RestTemplate to test our CRUD application. Now find the complete example step by step. Find the Gradle file to build the project. Find the Maven file to build the project. 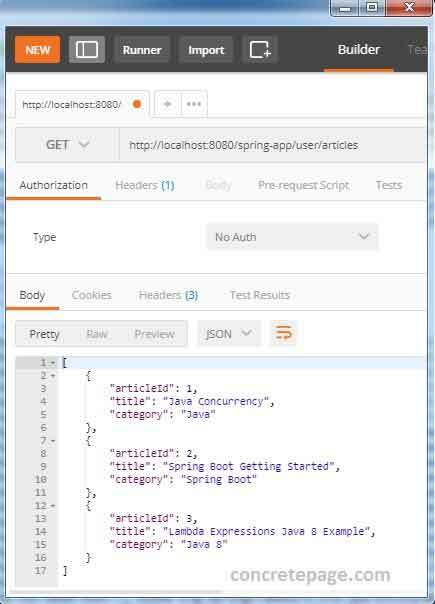 To use CrudRepository in our Spring data application we need to enable JPA repositories using JavaConfig or XML configuration. We need to create an interface implementing CrudRepository and then all are set to use it. Let us discuss step wise how to use CrudRepository in our Spring data application. We need to configure JPA repository location so that Spring data can find our all defined repository interfaces that are extending CrudRepository. We need to configure package name of our repository classes. 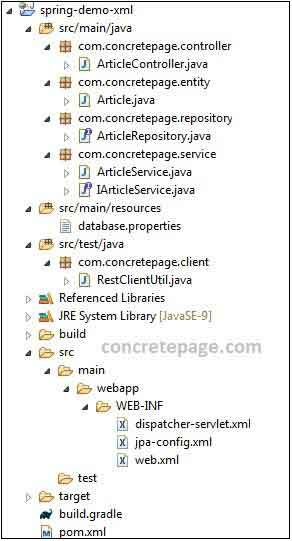 Here we will provide JPA repository configuration using JavaConfig as well as XML configuration. We need to annotate our JavaConfig class with @EnableJpaRepositories and pass repository package name. Find the code snippet. In XML configuration we will configure JPA repository as following. Find the project structure of our project using JavaConfig. Find the project structure of our project using XML configuration. We are using same project here as explained in demo project using JavaConfig but with XML configurations. Find the XML configurations now. 1. Import table in MySQL database given above on this page. 6. 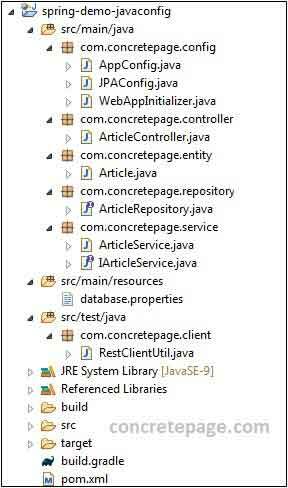 To test the application, use RestClientUtil.java file given in the demo project. We can also test application using Postman. Find the print screen.